Late to the party again, but this time I am in revival mode. I have found a wine I like. I have found a wine I drink every other night. It is called rosé. 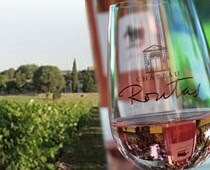 "But over the last couple of decades the supermarket shelf space allotted to Rosé wines has diminished rapidly, and although Mateus and its brethren are still on the shelves, putting a bottle of rosé in your supermarket trolley instantly marks you out as being horribly unsophisticated and embarrassingly out-of-date. Yet this is not the case in the South of France. There, they drink rosé by the tanker-load. And, by and large, they are more fashionable, chic and 'foodie' than most of us in middle England. Wander past the bistros in trendy Cannes, St Tropez or Cassis, and you'll see what they drink with their Bouillabaisse: probably not white, not red, but pink." I will drink to that! Photo pulled from here.